You don’t have to look too far to find new inspiration for a Shadowed Earth game. In fact, Osprey Publishing, under their Osprey Adventures imprint, recently published a book by well-known author and historian Kenneth Hite called The Nazi Occult. This book contains a wealth of fact, fictional, and speculative information regarding the Nazi’s and their interest in the occult along with information regarding the manifestation of what they found (or rather didn’t really find). The Nazi Occult is written in a factual method, although it’s pertinent to understand that much of it is not, so that the reader experiences the content much as they would any other historical presentation. However, what makes it so different is that the book takes the missions surrounding the Nazis and their search for occult relics and magic (whether real or imagined) and turns their discoveries into supernatural reality. In other words, it’s presented as reality surrounding many supernatural events, but it’s all so far fetched that it can almost be comical at times. However, the way in which it’s presented is so biographical that you’d swear it’s real and being told from the perspective of someone that witnessed the events, retelling the story of their life or maybe someone else’s. In my opinion, that’s what Kenneth Hite wants you to feel. He wants you to experience this book as though everything therein actually happened and you’re left to draw your own conclusions of what happened next. When you think of it this way, the book fits perfectly within Shadowed Earth. The stories told and the timeline of Shadowed Earth is one where reality is mixed with supernatural horror and a twist of fantasy. That’s exactly what’s presented in The Nazi Occult; the activities of the Nazis, and their predecessors, relating to their investigation of the occult, mixed with supernatural horror and a twist of fantasy, turning it into reality! The events portrayed in The Nazi Occult can be turned into a campaign for Judgment Day, pinning the hand of the Inquisition against the scholars within the Nazis. Who’ll find the lost lands first? Who’ll discover the magical artifact? Who’s hunting who? The events all take place in the early parts of the 20th century, leading up to and during World War II. (Not to mention the lead-in information leading up to World War I.) Another idea is to assume the role of members of the Nazi party, or its predecessor the Thule Society, hunting down occult relics and chasing leads all over the world. The only thing to remember, is that within Shadowed Earth all of these events were real and their outcomes, as described in The Nazi Occult, are reality! Maybe you don’t want to be a part of the Inquisition or the Nazis, you could instead partake in the activities of the Illuminati attempting to shadow the Nazis and either reach the destination first or sabotage the findings. In these regards, The Nazi Occult is like the ultimate Shadowed Earth sourcebook for the early 20th century regarding the occult and the Nazi party. Some of what you’ll find includes: runes, sorcery, djinn, werewolves, occult rituals, tibet, and a whole lot more! 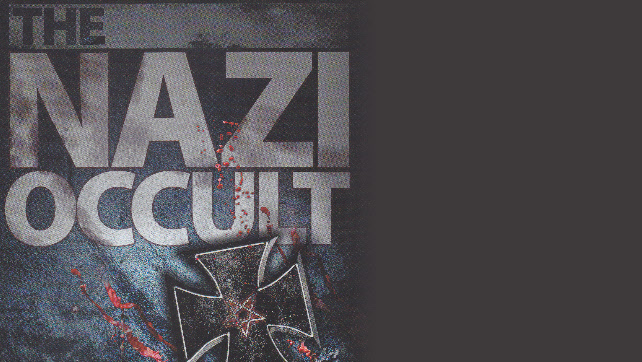 Dark Osprey 1: The Nazi Occult can be picked up at major book retailers. I got my copy at Barnes & Noble.